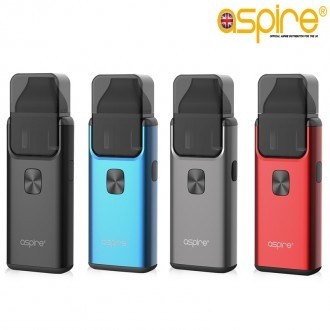 The Aspire Breeze was one of the first modern stealth vaping systems to be released. It was portable, easy to use, and worked as a perfect all in one setup. Yes there was some things feedback that could be improved on and so we listened to all the critics and have now released a second updated version, the Aspire Breeze 2. 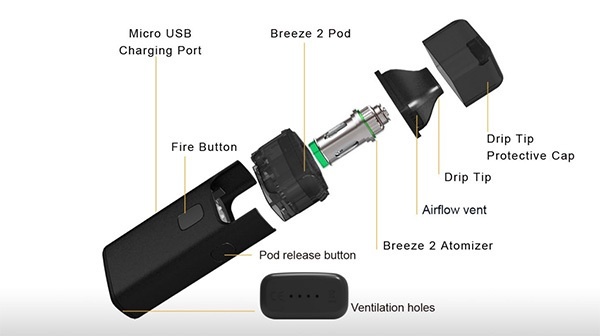 The Breeze 2 keeps a very familiar form factor to the original stealth setup, but this one has a “pod” located on the top. One of the biggest complaints on the first version was the inability to quickly fill your e-liquid or change the coil without getting your fingers covered in e-liquid. How do you fix that? You add a pod to house the e-liquid. With the Breeze 2 by Aspire you can also purchase additional pods – the pods don’t need to be discarded because you replace the coil inside of the pod. The original coils will work with this new version – plus there is now a 1.0ohm coil which is the perfect medium between the 0.6ohm Breeze coil and the 1.6ohm. The pod secures into the base of the battery by two locking clicks – you must press the pod release button to remove your pod, please don’t rip the pod out of the Breeze 2. The dimensions are similar in size to the first version coming in at 95mm x 35mm x 19mm. Backward Compatible With Breeze 1 Coils. 0.6ohm & 1.0hm Coil Included. What you get in the box ? x2 Replacement Coils (0.6ohm & 1.0ohm). The Breeze 2 pods have a 2ml TPD Compliant capacity. One of the largest upgrades on this new version of the Breeze is the battery – the Breeze 2 has a 1,000mAh internal battery, nearly double the capacity of the original. One of the other massive improvements on the Aspire Breeze 2 is adjustable airflow – the original had set airflow and you couldn’t change it, while this one features an adjustable airflow ring that is so easy to operate.